The rain cleared for a day to make way for AMA Supercross to come back to Angel Stadium in Anaheim, CA for the third round of the season. Rockstar Energy Husqvarna Factory Racing’s Martin Davalos earned another top-10 finish with a fifth in 250SX West, while teammate Christophe Pourcel made an appearance in his first 450 main of the season. Martin Davalos got second at the start of his 250SX West heat and was on the move. He stalked the leader for the majority of the race and was close to making an inside pass for the lead with three minutes left in the heat. He pushed his Husqvarna FC 250 and had the leader in his sights with less than a lap and a half to go. He held strong to his position and finished second to transfer directly to the main. Davalos pulled a top-10 start in the main and was sixth by the end of the first lap. He made his way into fifth and held strong to that position for the remainder of the race. He is currently fourth in 250SX West rider point standings. “A2 was interesting,” said Davalos. “I feel like I’m trying to chase a setting and I just can’t figure out what it is. I don’t want to push too hard and risk getting hurt. I’m heading back to Florida tomorrow to clear my mind and really get things going." Christophe Pourcel posted the fifth-fastest time during 450 qualifying practice aboard his Husqvarna FC 450. He started around 10th in his heat and finished ninth. In the semi, Pourcel started in eighth and immediately pushed his way into fourth before making two more passes to overtake second before the end of the first lap. He held strong to finish second and transfer to the main. He started in the back of the pack in the main and got caught up on a hay bale at the end of the start straight. He moved up to 16th by the end of the first lap and continued to push to 14th where he finished. “Today was decent,” said Pourcel. “I qualified pretty good - in the top 5. I got a pretty good start in the semi and ended up second. I just kind of did my thing, but I’m riding pretty tight. The track was rough during the main, and we saw some guys crash, so I’m happy I’m healthy." Jason Anderson pulled a mid-pack start in his heat and, while on the move toward the front, collided with another rider, which would leave him out of a transfer position. Following the on-track incident, Anderson was disqualified from the night’s race due to an off-track incident. He will return at next week’s race in Glendale. 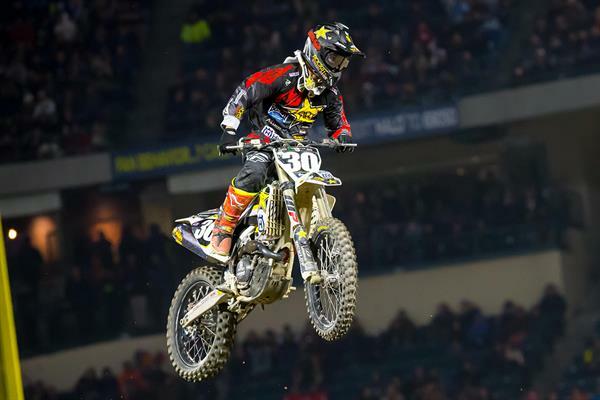 The Rockstar Energy Husqvarna Factory Racing team will now make its way to the University of Phoenix Stadium in Glendale, AZ on Saturday, January 28 for the fourth round of the series.